A love of all things coastal -- and a devastating earthquake -- inspired Caron White to launch her decor shop Caron’s Beach House in Washington state as a brick-and-mortar in 2002. Five years later she was again inspired in a new direction -- to close her store, regroup and take her business 100% online. Since she relaunched Caron’s Beach House in 2010 as an e-commerce site, she’s never been happier. She’s worked hard to make her business a well-oiled machine through outsourcing and targeted marketing, which means Caron’s enjoying the freedom to travel the world that comes with not having to run a brick-and-mortar store. We spoke with QB Community member @caronsbeach2 about how she attracts high-end customers, competes with big box stores and why there’s no going back for her after going online with her business. Hi Caron! Tell us about what you did before you became an entrepreneur and why you decided to work for yourself. I worked for a large bank in sales and I was always traveling and working with customers. I was always the number one sales person at our company, but I was working for other people and I knew I wanted to work for myself one day. I like design, I like home interiors and it was my hobby and my passion. It dawned on me one day to figure out how to turn that passion into a business. It took me several years of planning and working up the courage to open my store, but it wasn't until 2001 when there was a bad earthquake in Seattle and everything was closed -- the bridges and ferries -- and it served as a reckoning for me. I said “I don’t want to do this anymore.” I knew then that I could do something different that was better for our family. That's when Caron's Beach House was born. What are Caron’s Beach House and Lake & Lodge Decor and what do you do there? At Caron’s Beach House we sell coastal home decor, that includes anything that you’d put in your house if you live at the beach or want to look like you live at the beach. It’s all beach-focused -- accent furniture, pillows, rugs, lamps, glassware. And Lake & Lodge Decor, which is brand new, is the same idea but for lodge or lake homes. We’ve had Caron’s Beach House -- the online version -- since 2010 and we figured out over time that we had a lot of customers who had second homes and lake houses who were buying from us. We did the research for a couple years and realized there was a market there -- customers who did not live in a coastal area. We reached out to them and asked, “How did you find us and why and what else are you looking for?” We talked to friends who owned homes in Montana and Wyoming and other places where there aren’t many brick and mortar stores to shop for decor. We saw an opportunity to appeal to that market, as well, and opened Lake & Lodge Decor. Who is your target customer? Describe who she is and why she shops with you. Our target customer is someone who reads Coastal Living magazine. She’s somebody who is looking for something special for her home. We’re more in the mid- to high-end price range and we are very purposefully not a discount store -- we don’t compete on that level with big box stores. We find decor that makes your home special by offering lots of custom things and working with designers. We’ve curated things that are high-quality and long-lasting. I’ll look for things that are made in the USA so we don’t have problems with returns. We’re trying not to look like you went to the gift shop at the beach and brought home something cheap. You previously had a brick-and-mortar shop. Why did you decide to go completely online? We really like our customers but I decided that we could do more, travel more and it would be easier for me to open a totally online store. Number one, we wouldn’t have to manage staff -- the store had 9 employees! Now, I have one employee and she lives in my town, and everything else we outsource. I have a web designer in Seattle, we have phone services outsourced to a call center in Pennsylvania where they do all of our online chatting and talk to customers who call to place orders. I absolutely prefer being online. The biggest difference is I think between having a brick-and-mortar and being totally online is with a physical store you are there all the time. It’s not in your house or in your office and you’re waiting for people to walk in the door to makes sales. Sometimes you can’t get people to come in -- because of a bad parking lot or it’s pouring rain or the wrong season, for instance. The difference is when you’re online customers come in all the time, you can get them to come in by paying for Google or Pinterest ads. How did you rebuild your store from brick-and-mortar shop into the e-commerce site it is today? I knew that if I was going to be an online store, I’d have to have a shopping cart system which are anywhere from free to thousands of dollars a month. So I had to do a lot of research and understand e-commerce. Before we launched the site, it took hours and hours to write all the product descriptions and get them up with photos. We don’t ship anything ourselves, instead we drop-ship everything directly from the manufacturers or artists to our customers. We send our suppliers our branded packaging and they use that to send out our products. We outsource the inventory management, as well. As a small business managing shipping costs, supplies and inventory was unthinkable and not worth it, so the outsourcing works well for us. The items you sell are high-end and aspirational. How do you reach the right customer to buy your upscale décor? I use Pinterest to create looks and rooms --like a tropical-themed room, for instance. We have a hundred different boards and every board has a different look. We have 50,000 followers on Pinterest and it’s the best place for us to be seen and market. Instagram works a bit for us, and Facebook not so much. We also write two blogs about coastal design, producing a lot of content and updating it regularly. We have another blog called Everything Coastal, which is more lifestyle content -- it’s a standalone blog and it links back to us. We’ve been featured in Coastal Living magazine and in HGTV magazine. If you type in “coastal decor” on Google I guarantee we’ll be on the first page of results. We spend a lot of time on the SEO and getting those keywords just right. Home décor is a huge market – from big box stores like Target to huge online retailers like Wayfair and Overstock – how do you differentiate your shops within the home décor market? I stick to my lane. We do coastal and that’s all we do. We don’t try to be Chip and Joanna Gaines and do farmhouse, too, or any other specific look. If a new look becomes popular, we will still stick to our look because we do that really well. We can’t be everything to everybody and if you try to be you’ll fail. You have to just be what you are. When you first started your business is there anything you would have done differently looking back today? No, because everything that you do you learn from. I could say that I wish I had more capital, but at the same time when you don’t have a lot of initial capital it makes you scrappy and you learn to be resourceful. We don’t have as much money as Wayfair, of course, but we’re going to write blog posts and use Pinterest and Instagram and other things at our disposal that are free to reach our customer. What advice do you have for budding entrepreneurs just starting out or who might be contemplating self-employment? Working for yourself is not always glamorous and it’s always hard work. You have to be prepared that it is going to be hard work. You need to research and make sure your idea is sound. Maybe don’t go out and get a bucket of money until you’re really certain that your idea will work. Make a plan and know what you’re doing and ask lots of questions and read lots of books. And don’t be afraid - you don’t have anything to lose! Do you think about retirement or your business someday coming to an end? At this point I love what I do. I love the challenge and the customers. It’s the kind of business where we can still travel so I don’t feel the need to save up a bunch of money and then retire. As long as all the parts keep working, I can go anywhere! Having an online business gives you the freedom to do this, as opposed to being stuck in the store! 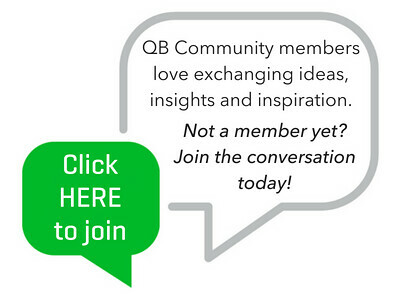 QB Community members, have you ever reinvented your business? How did you do it and why? Ah - thanks Sarah! It was fun to talk the other day, actually re-inspired me as I am typing and planning furiously for the coming holiday season. Cannot believe how fast it comes every year! Thanks for your time and insights, @caronsbeach2! It was great to learn about your business model and how you've grown and changed over the years. We'll have to catch up with you when you launch your third store maybe?? Great article, @caronsbeach2 - and fantastic pics! Half Moon Bay is an amazing little town, at least it was little when I grew up there. This was a great article that took me back to memories of my younger years! I would love to hear any tips or tricks you may have regarding SEO, I always feel there is so much more that I have to learn to keep our listing relevant online! Hi! SEO is a constant moving target - wish I could share some magic bullet to share with you. We are constantly tweaking our categories and our product descriptions to make sure that everything reflects our brand and edit to make sure that we have included as much detailed information as we can. Not always possible, as in many cases we are relying on our manufacturers to provide us with specs and info.